For brothers Mogens Lassen (1901-1987) and Flemming Lassen (1902-1984), there was never any doubt that they would become architects. They were born into an artistic family and the ability to create came to them naturally. While other neighbourhood boys played with toy cars, the brothers spent their time surveying buildings and sketching them. They were born to be architects and they both took on their roles with pride. Their enthusiasm spread beyond their brotherly partnership, and their passion for their future profession emanated to their classmates at the boarding school in Nærum which the brothers attended along with their good friend Arne Jacobsen. They even convinced him to become an architect, and since he would otherwise have become an artist, the brothers later received a letter of thanks from Arne Jacobsen’s father. Although the final goal of becoming recognised architects was crystal clear for both Mogens and Flemming Lassen, the path to reach that goal was not without obstacles. Mogens Lassen had dyslexia, and he longed to begin his career as an architect. Money was also tight, and both brothers would find themselves taking an alternate route to architecture rather than graduation from the Royal Academy. But their talent was profound and both of them would secure apprenticeships that rapidly brought them renown. Later, both Mogens and Flemming Lassen would achieve great honours, gain acceptance in the academic architect circles, and garner a lifelong wealth of awards and recognition for their work within design and architecture. 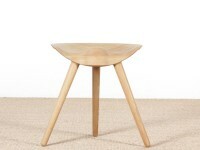 Mid-Century modern scandinavian stool model ML42 by Mogens Lassen, new edition. 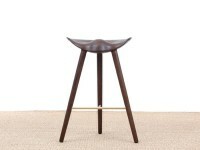 Mid-Century modern scandinavian bar stool model ML42 oak, 69 /77 cm, by Mogens Lassen, new edition. 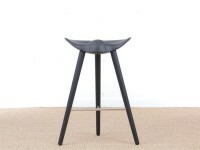 Mid-Century modern scandinavian bar stool model ML42 black, 69 /77 cm, by Mogens Lassen, new edition.